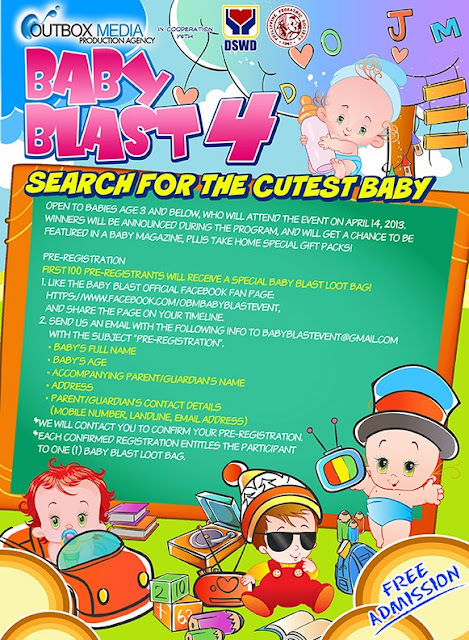 BABY BLAST 4: Discover. Create. Imagine. Explore! Kids nowadays are spending less and less time outdoors, having been exposed to gadgets and other forms of technology even as infants. But recent studies show that children, especially those aged 3 and below, who play outdoors regularly grow up happier, healthier, and stronger! Outbox Media Production Agency once again invites you to the grandest family event of the year! Now on its 4th year, BABY BLAST, an annual event focusing on the importance of Early Head Start (EHS) Education, continues to bring together EHS advocates, teachers, doctors, parents and kids, through a fun-filled family event happening at the Trinoma Activity Center on April 14, 2013, from 10am-7pm! This year, “BABY BLAST 4: Discover. Create. Imagine. Explore!” focuses on the importance of allowing babies and kids to experience the outdoors and engage in physical activities that can benefit their social, mental, physical and emotional development, given today’s tendency to merely rely on gadgets and technology to keep kids busy. Find new discoveries in the amazing world of books, toys and technology! EHS schools will also be present to show the programs they offer! Get hands on with creative projects like arts, crafts, baking and even robotics! Let your child's imagination run free with mind-boggling experiments and fun activities! See how learning begins with exploration and fun play through Early Head Start! 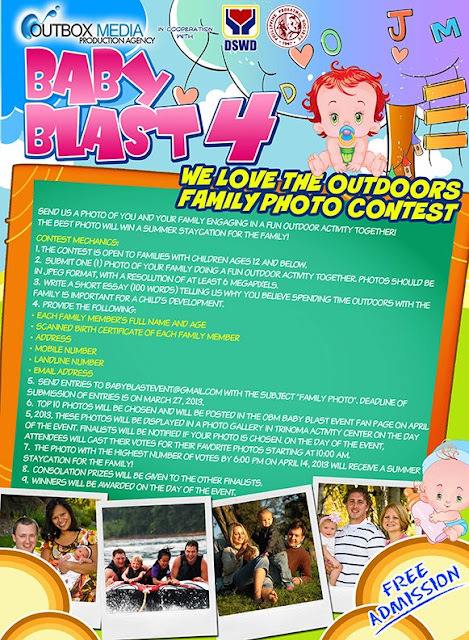 Send us a photo of you and your family engaging in a FUN OUTDOOR ACTIVITY together! The BEST photo will win a summer staycation for the family! For kids age 5-12 years old: interpret this year's event theme through a T-shirt design artwork: Baby Blast 4: Discover. Create. Imagine. Explore! 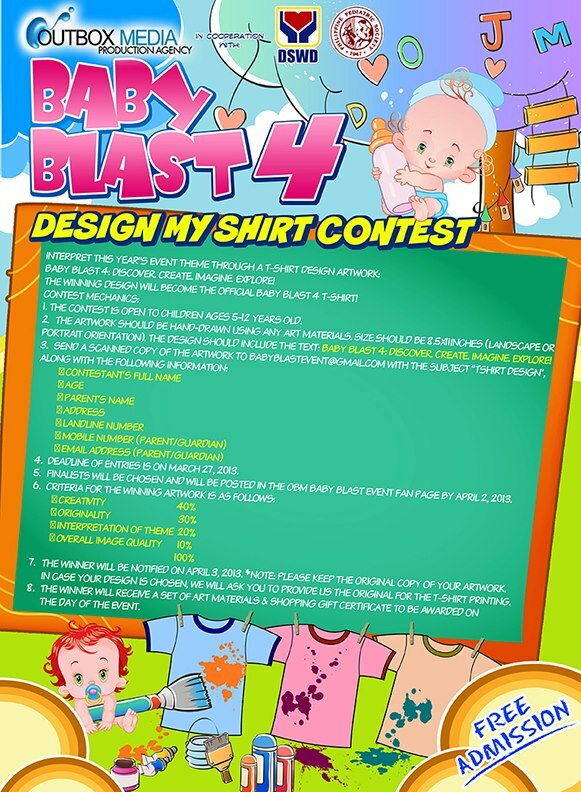 The winner will get fun prizes and the design will become the official Baby Blast 4 T-shirt! 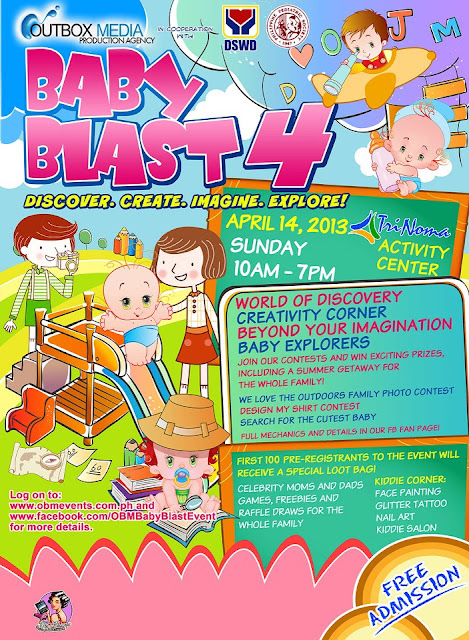 Open to babies age 3 and below, who will attend the event on April 14, 2013. Winners will be announced during the program, and will get a chance to be featured in a baby magazine, plus take home special gift packs! Pre-register now and you may get a special gift. The first 100 pre-registrants will receive a special LOOT BAG! For more info, LIKE the Facebook page: OBM Baby Blast Event , or log on to www.outboxmedia.com.ph! Henry's Mom Blogs is an official media partner for this event.